We were so lucky to be invited to Ramada Encore Gateshead for a gorgeous dinner date. Just what we needed! This week has been so busy, for both of us, and we’ve felt like we’ve barely said anything other than a “hello” and “goodbye” as we ran out of the house on a morning/returned home on an evening. It’s been sleep, eat & work an awful lot. 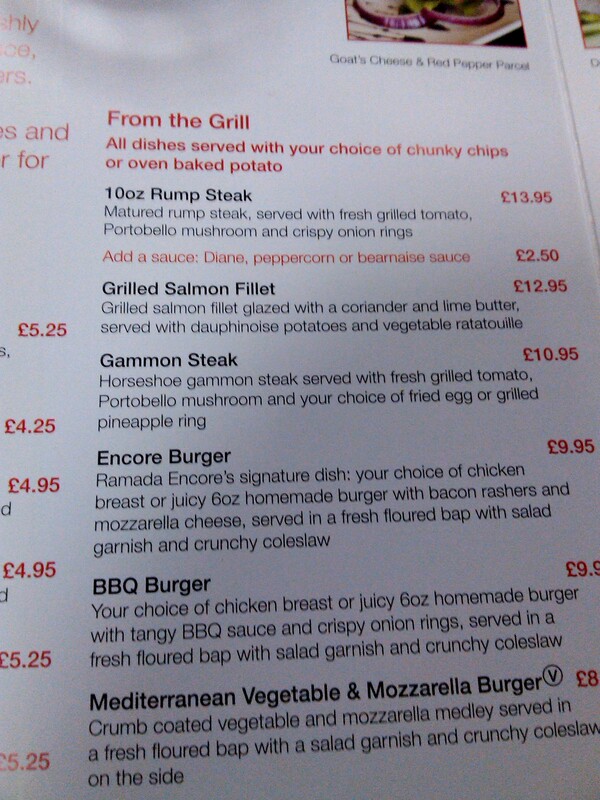 That’s why we were so excited to go on a lovely dinner date on Thursday night at Ramada Encore Gateshead. Ramada Encore is a contemporary, modern hotel situated just minutes from Gateshead quayside, and makes an excellent base for a visit to Newcastle – as luxurious restaurants, night-life and arts are within easy walking distance. We were a little unsure when we first walked into the hotel where The Hub restaurant was, but friendly staff guided our way, and we were introduced to Robyn, our waitress, who promptly sat us down at a lovely corner table and offered us drinks. The first thought we had was how comfortable and relaxed the restaurant was, while still having a sleek, uncrowded glamour. Our favourite songs played over our heads while we poured over the menus. There were two options: the specials menu or The Hub menu. The Specials Menu contained a starter, main course and dessert with a small description underneath of where the main ingredients were locally sourced from. An excellent idea! 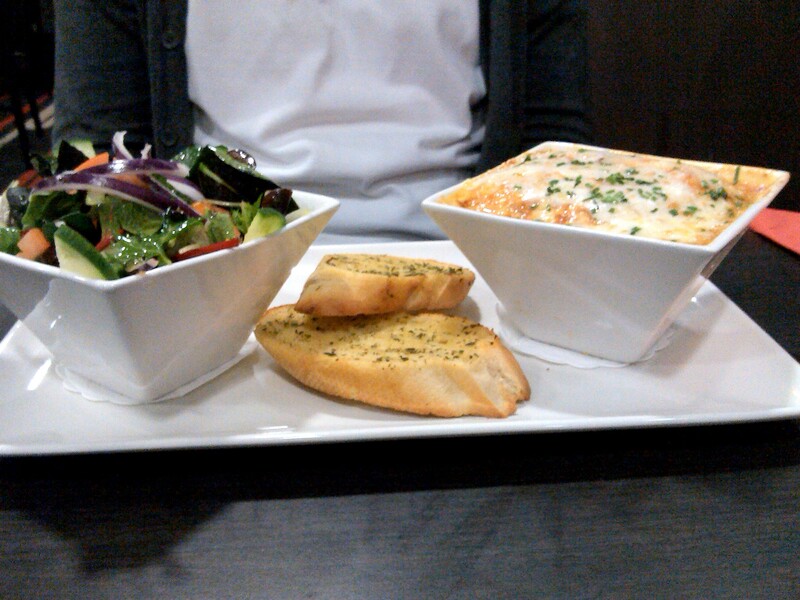 The Hub Menu was quite extensive, with a lovely choice of options for starters, main courses, desserts and side dishes. The dishes weren’t over-complicated or specialised but rather full of well-known, comforting English meals with an elegant twist. I decided to have the homemade soup of the day (£4.25) to start, followed by the grilled salmon fillet glazed with coriander and lime butter, served with dauphinoise potatoes and vegetable ratatouille (£12.95). MrJ ordered the chicken and bacon terrine served with toasted ciabatta and accompanied with a tomato and coriander chutney (£4.95), followed by the lasagne served with garlic bread and salad. Our starters arrived promptly and were beautifully displayed. My soup (which was pea & ham) was delicious and I had to stop myself from just wolfing down the whole thing in one go! 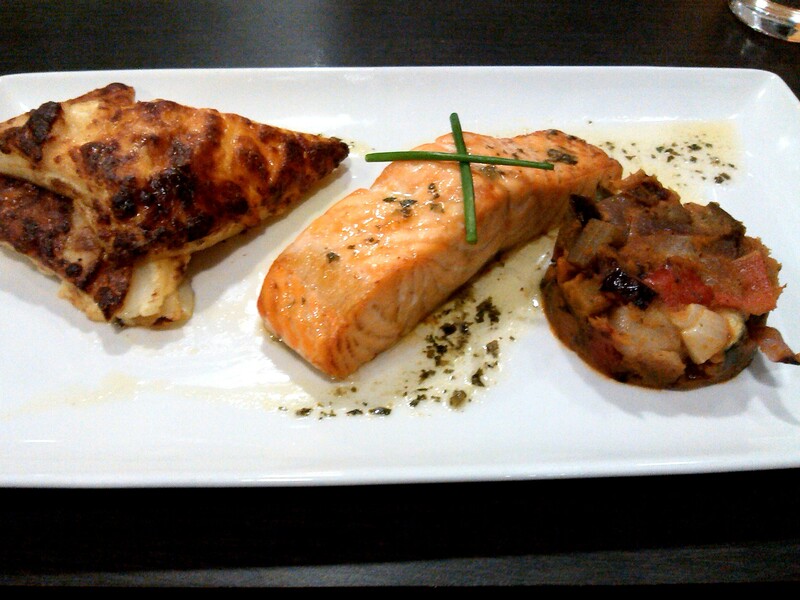 From tasting our starters, we had high expectations for our mains and we were not disappointed! Our main courses arrived, and we could see that they had been individually prepared and were very good portion sizes. As we tucked in, we both exclaimed how much we were enjoying our food and it’s just what you want from a hotel restaurant when you’ve had a busy day exploring the city. I started to get quite jealous of all those people who could just head up the stairs to their lovely hotel room waiting for them, instead of having to drive home in the car once they’d finished their meal! Robyn, our waitress, was so attentive without being over-bearing and MrJ was glad he had taken her recommendation for the lasagne, as it was delicious! Also, the salad that came with it was so colourful and fresh! Something that sometimes goes amiss in other restaurants. 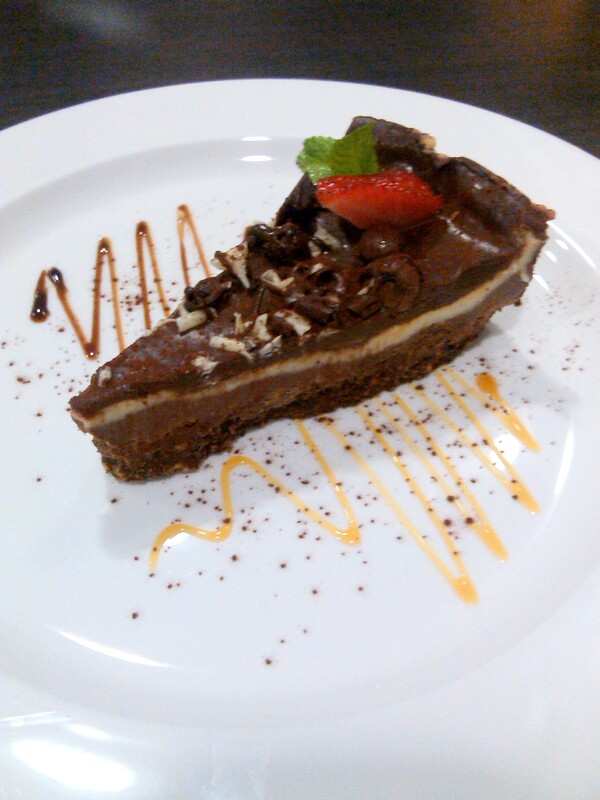 After we had finished our mains, we were offered the desserts menu. 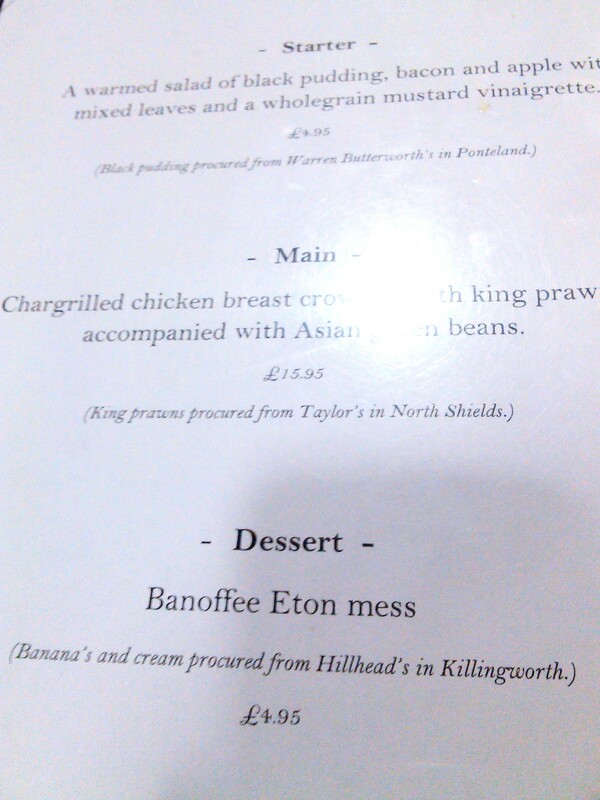 I felt too full for a dessert, but one look at the choices on offer made me think again! 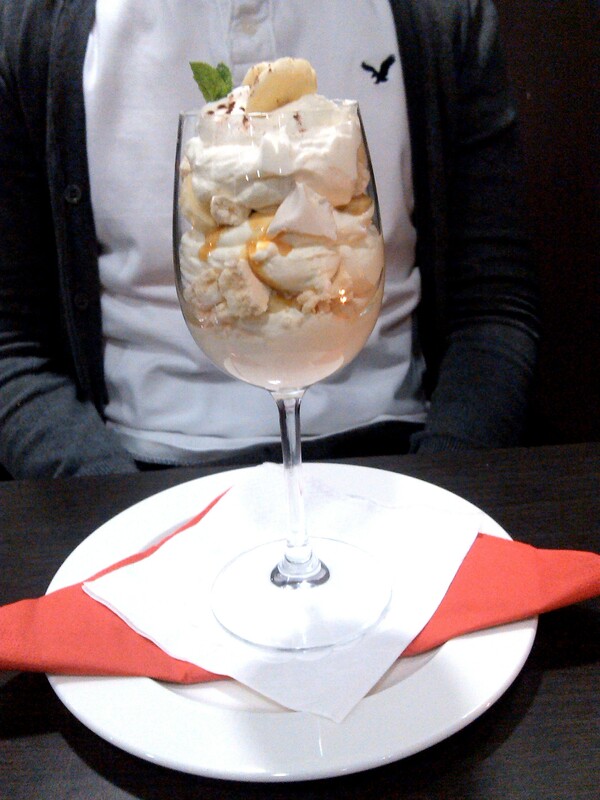 I ordered a Rocky Road Cheesecake (£4.95) and MrJ ordered the Banoffee Eton Mess (£4.95) from the specials menu. I really appreciated the time taken in between each course, as it wasn’t too long but gave you enough time to be fully ready (in stomach and mind!) for when the next course arrived! After our sweet treats, we declared ourselves fully full! We sat around for a while, sipping our drinks and just chatting. The atmosphere was so pleasant that I felt like I could happily chat the night away in our surroundings. As we walked outside to our car, we saw the stunning Sage lit up in the night and just realised how close Ramada Encore Gateshead actually is to all the hustle and bustle of the quayside, and what a fab location it would be for a weekend away! Pity we only live a 3min drive from the hotel, as I quite fancied booking myself in a room for the night! Ramada Encore Gateshead can be found at Hawks Road, Gateshead Quays, Gateshead, Tyne & Wear, NE8 3AD. Check out their website or give them a call on 0191 4813600 to book a room or table at their restaurant.